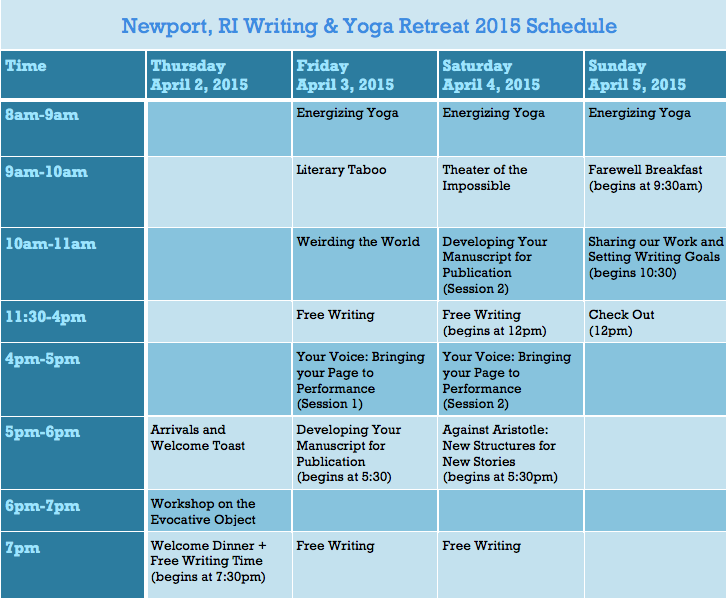 Included in the $650 tuition are all daily creative writing workshops, craft of writing seminars, one-on-one manuscript consultation, orientation dinner, toasts, and farewell brunch, plus daily yoga and meditation classes. Shared room lodging is included. Please send us an email to inquire about partial attendance ($375 or $475 with shared lodging). Please inquire about optional add-ons include aromatherapy, massage, and reiki healing. There are limited seats for this workshop so apply early! There are limited seats, so apply early! 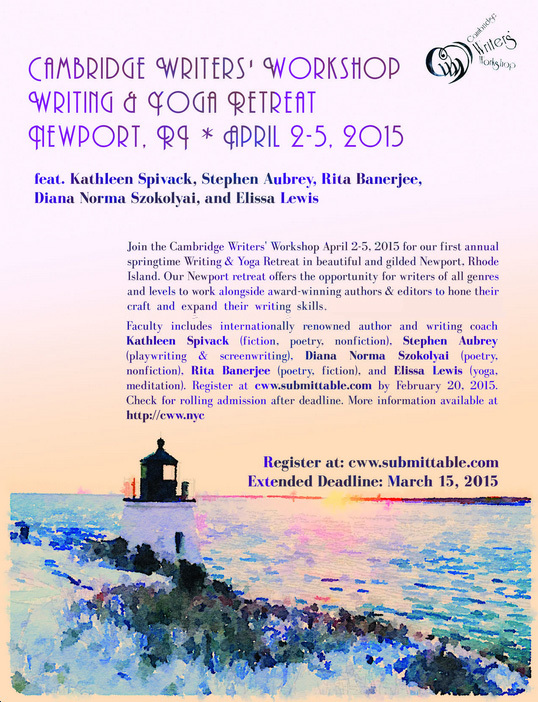 The extended deadline for admittance for our retreat is March 15, 2015. Apply at cww.submittable.com. Faculty includes internationally renowned author and writing coach Kathleen Spivack (fiction, poetry, nonfiction), Stephen Aubrey (playwriting, screenwriting), Diana Norma Szokolyai (poetry, nonfiction), Rita Banerjee (poetry, fiction), and Elissa Lewis (yoga, meditation). 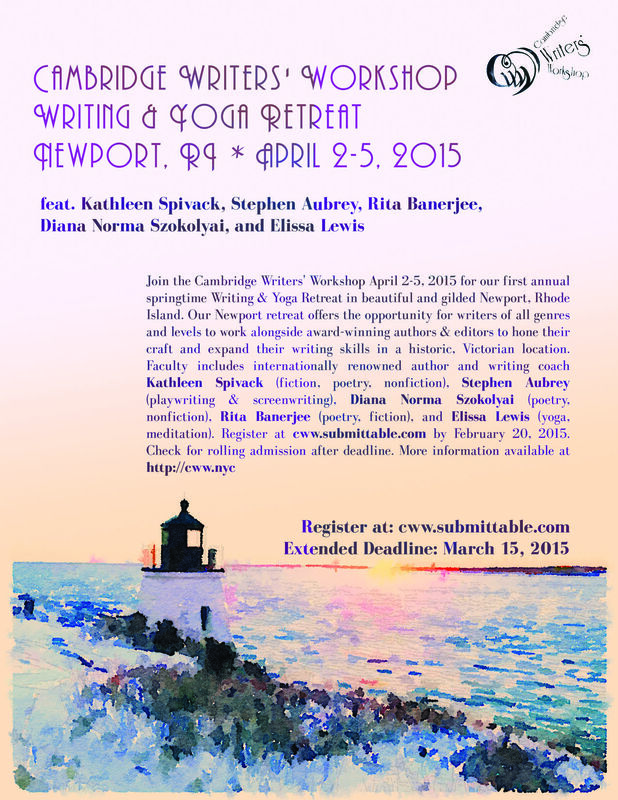 This entry was tagged Cambridge Writers' Workshop, Creative Writing, Diana Norma Szokolyai, Elissa Lewis, fiction, Kathleen Spivack, Meditation, Newport, nonfiction, playwriting, poetry, Rereat, Rhode Island, Rita Banerjee, Screenwriting, Spring 2015, Stephen Aubrey, writing, yoga. Bookmark the permalink.